Because the handler depends on the service dog's help, service dogs are allowed to go to most public places the handler goes. This is the case even if it is somewhere pet dogs usually cannot go, like restaurants or on airplanes. But there are a few exceptions. 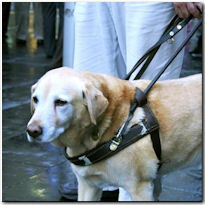 For example, service dogs can be asked to leave if they are not behaving well. *The links above will take you outside of the Department of Veterans Affairs Website. VA does not endorse and is not responsible for the content of the linked websites. The link will open in a new window.